The letter grade printed on a report card is usually a fairly straightforward combination of effort and execution: 10% homework, 30% quizzes, 60% tests. Assessing a student’s learning is not as easily measured. It involves looking across a variety of assessment types, talking with students’ about their thinking, listening to their questions and seeing how students respond to opportunities for revision. Your child’s grade may or may not reflect this variety of assessments. Research also raises questions about the role of grades in representing students’ learning. A 2012 study at the University of Windsor corroborates more than a decade of research that grading practices can undermine student’s motivation to learn. 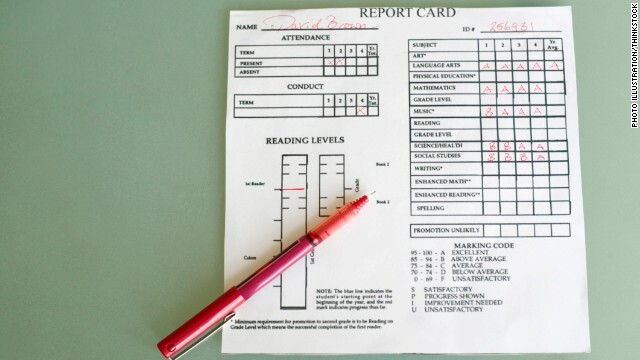 In addition, a 2012 study led by the University of Pennsylvania finds that report card grades more often reflect students’ self-control than what students know and understand. And a 2012 report on the Ethics of Grading highlights that grades are too often a subjective measure of achievement. In light of such findings, school districts in Kentucky, Florida and California have eliminated traditional report card grades in favor of assessments that gauge students’ mastery in specific areas and separates success on homework completion from students’ achievement. Similarly, a handful of colleges across the United States, such as Bard College, Brown University and Hampshire College, offer students the option of receiving narrative descriptions of their performance instead of or in addition to traditional letter grades. As you review your child’s report card, instead of focusing on the grade alone, try to find out what your child learned in class this quarter. Take a look at the work your child produced and have your child tell you about a few pieces. Discuss whether the class was too easy, too hard or just right. Ask your child if his grade reflects how much was learned - you’d be surprised at how articulate teens can be about what it takes to get an A in certain classes. See which subject she thinks she learned the most in and why. Is there a class where he or she could have learned more? Of course, grades do matter in the wider world. Hundreds of thousands of high school seniors will submit college applications from now until January for the following school year. Yes, transcripts, grade point averages and class ranking are key factors in admission decisions. Some even argue that grades predict future earnings. So it is impossible to ignore them. Still, I’d rather focus on my children learning important concepts and strategies for thinking, as well as tools for learning how to write, communicate and solve complex problems. That all must matter more for the kind of people they become and the ideas and work they pursue than a single letter. Until keener, alternative assessments are adopted at the elementary and high school levels in this country, we will have to take our A, B, Cs for what they are worth. And for many students and their parents, they are not worth much. Spending the holidays away from bickering about grades and report cards might make these weeks happier for everyone involved. Instead, parents and children can add effective learning to their wish lists for a happier New Year. The opinions expressed in this commentary are solely those of Miriam Gamoran Sherin. I forget which country is leadin the world in education, but I believe it's either Switzerland or Finland. Anyways, you should all investigate how they run things and duplicate it. constantly check the online system, which displays current grades, haggle for extra points and jump on any extra credit opportunity, all to get the A. When a teacher announces a test, I immediately ask how many points it is worth and calculate the minimum grade I need to get in order to maintain an A. This obsession is not my fault. I am mere a product of the current education factory that manufactures multiple-choice assessments and labels students with a letter and a grade point average. Teacher’s say we should learn for the sake of learning, but why then do we get judges every quarter on a report card. Why, on Naviance, the online program for college searches, when we look at the college scattergrams, are the only two factors of acceptance SAT scores and G.P.A.? I did the same – and that was 30+ years ago. Parents stop hovering over your kids! We need to teach our children about responsibility and accountability – I'm so tired of hearing about our children's "self-esteem" and "fragile characters". When I was a kid, if I didn't do my homework or study or got a bad grade – I got grounded. Not just a silly "time-out"... but literally grounded for at least 1 month, which meant at the time, no phone, no t.v. time, and no hanging out with friends. Did it teach me to study more and turn in my homework? You bet it did! Children need discipline and boundaries – parents need to stop trying to be their child's best friend and be the parent and role model that the child really needs! Good grief – we're raising a bunch of wimps and ungrateful children who can't accept "no" as an answer. Put God back in our children's lives, allow teachers to be firm and fail our children if needed, and above all else – love them while teaching them the real lessons in life. Well said. Parents need to stop enabling their kids. This is the best post I have read yet! Parents should always talk to their kids about their grades. I have been a teacher fro 24 years and I can honestly say grades do make a difference. Kids fail and kids pass, there are reasons for both. Parents seldom want to hear why their child is failing. They want excuses. They want anything but the truth. For those that confront the reasons for failure, I have seen remarkable improvements. Teachers are pushed by administrators to pass those we shouldn't and then to justify countless times why a student is failing. It gets exhausting to be the the bad guy; getting hit from both sides. I enjoy my job a lot but I am soon to retire. I teach middle school math and two plus two will always equal four. I say this over and over yet I am expected to give partial credit for wrong answers and then get every student up to grade level – even the ones who miss 30 days a school year. All I have ever asked for is logic to prevail. Families, students, and teachers all have issues. Let's confront our issues together but not be afraid of the answers. Actually, China is better. Our education system is crumbling. 1) teachers hate them. My high school required teachers in addition to assigning a grade, to give a 1 paragraph blurb of comments for each kid. Most teachers wrote 6 blurbs, and assigned them according to the grade. 2) teachers aren't gods. They actually don't spend all that much time with each kid, especially in a 30 person per class, 8 class per day high school. The letter grade, combined with homework grades and quiz and test scores, are about as complete of a picture as they're capable of providing–and to a discerning eye, they're not bad evaluations. There is absolutely no great way of evaluating a kid's performance in a standardized way, because if there was, corporations that spend tons of money trying to figure out the best way of evaluating personnel would have already patented it. That said, though personnel reviews affect bonuses and promotions, there's a reason people don't take them personally. Just accept that report cards may be inaccurate, but college admission standards are not going away, and adjust your learning strategies accordingly. Your belief that we should accept report cards for what they are is offensive. America cannot just accept a failing system for what it is. We are a nation of innovators, trailblazers and pioneers. A solution can and must be found. I agree with Ms. Sherin in her argument that we should 'eliminate "traditional report card grades" and replace them with evaluations written by teacher's. The B next to Math, or A next to History does not reflect a student's learning capability. And isn’t learning what really matters? It's unfortunate that you were "offended" by the idea that we are forced to stick with an imperfect system. But consider this: We are also forced to operate under a republic. Is this perfect system of government? Of course not – we prove that time and time again. It is, however, the best we have to work with – well, arguably. I'm going to tell you something, and it may hurt; Even a "nation of innovators, trailblazers and pioneers" cannot create a system of education that provides completely accurate evaluations of learnedness. Our current system is the product of decades worth of refinement. Yes, it's completely screwed up right now, partly because our government is completely inefficient and cannot handle money. You can't just simply throw away what we have and start over though. That's not creative destruction; that's just destruction. It takes someone like you to get me to write a comment on here: an idealist, who points out a problem and offers no viable solution. 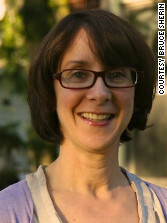 The author said herself that we must continue to consider grades – that's what colleges consider. You show me a college that would take "Little johnny learned calculus very well, despite only getting 70% of the material correct" as an acceptable review, and I'll show you a top-tier community college – maybe even the one you attend! The college admission process is crazy enough as it is. Throw in subjective reviews of each class with no standardized measure of the amount of content learned, and you've got complete chaos. I completely agree that this method of grading could work up through the 6th grade – maybe even the 8th. But to suggest that high schools should take this idea as anything more than a supplement to letter grades is not only naive, but also ludicrous. If you got a B in a Chinese family, ridicule and condemnation would follow. The lowest grade allowable for success is an A-. Maybe this is why China is going to surpass us as the #1 economy in this lifetime. Yay mediocre USA! I come from a Chinese family and I got Bs a couple times. As long as I could prove it was because the material was challenging and I worked hard for it, I got nothing but support. On the other hand if I ever bragged about an A I got endless ridicule for "undeserved hubris." It's far worse to get an A in an easy class than a B in a hard class. Don't simplify the Chinese too much; we're quite aware of the subjectivity of grades. All assessments are subjective. A person ( or group) decides on the content and then on the actual task and then on the grading of the task. There are a lot of decisions made during this process, most of which are based in opinion, albeit informed ones. Here is an example from my own field, physics. For either a pen & paper problem or a hands-on problem, I need to decide what information to make available. Do I give extra unnecessary information? Do I give it standard units or require a conversion? Do I give the information in the form of a graph where the student needs to slope or integrate to get the required number? Do I ask for a numerical answer or do I couch it in a “what will happen if” form which requires further analysis? Do I pick a scenario that is rife with potential misconceptions or do I give a more straight forward one or somewhere in the middle? The answer to all these questions is that it depends on the goal of the assessment. Which brings up a whole new list of questions. Where is the student in the learning process – near the beginning or late into mastery? Am I trying to get the student to assess what they know? Am I setting up cognitive dissonance for use later? Am I assessing how the student applies a large variety of knowledge, or only pinpointing a narrow skill that must be mastered on the road to a larger concept? Assessment of any type is an continuous ongoing and individual process and it always should be. I agree that parents should have these conversations with students about school, their classes, their knowledge etc. A lot of things learned in school do not show on a report card with a single grade. But there is more information available to foster these conversations. Many schools have teacher syllabi and other course information posted so the community can see the expectations. Many schools now have electronic gradebooks so parents/guardians/student can view the individual grades. Sadly, at least where I teach, not enough parents/guardians/students take advantage of that service.